This week's One Layer Wednesday challenge is being hosted by Heather. The challenge is to make a one layer card featuring something with wings. Heather used a butterfly and some sponging and made a beautiful, feminine card. Being the mother of a Royal Canadian Air Cadet, my mind turned to something more mechanical! We've watched quite a bit of formation flying over the summer and I've become very interested in this topic I previously had no interest in! I know about pitch and roll and yaw, and I know the names of the various formations that the Snowbirds performed at their summer airshows. Most of them, anyway! 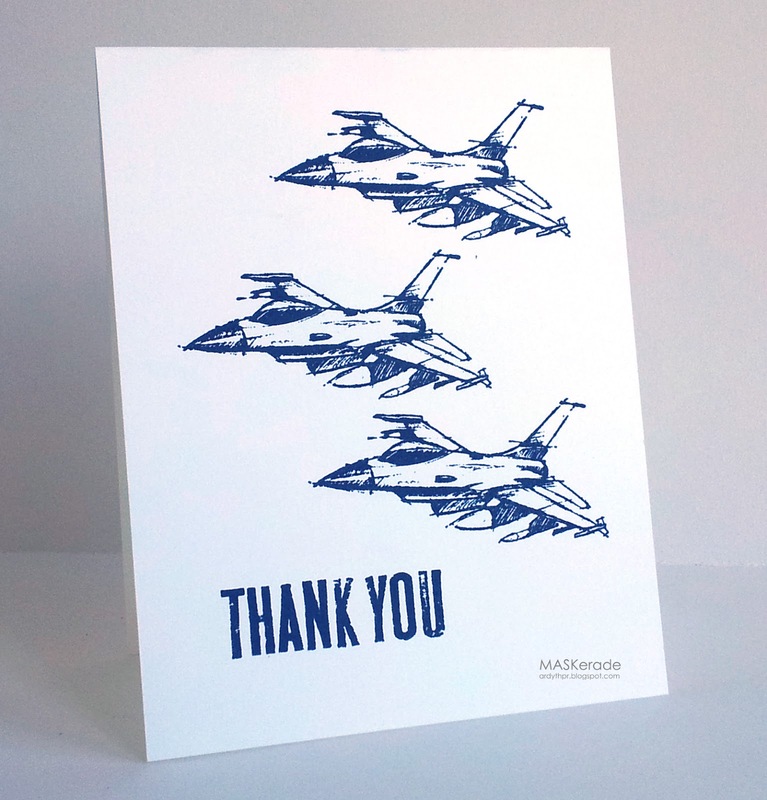 It never hurts to have some masculine thank you cards on hand, so I stamped this Stampin' Up image 3 times in black and then added an Impress sentiment that has the same sketchy, military feel. Wow! What 'guy' wouldn't love the get this fabulous card! I love your choice of images and the black on white is perfect! Sounds like you've learned a lot about formation flying...you must be a very proud mama! Oh this is awesome Ardyth! I love the images...perfect guy thank you. This is totally a perfect masculine thank you card! Oh yeah....totally guy! It really cannot get any better than this - planes and manly colors! Love all the white "air" space! Ahhh, Ardyth, you KNOW I love this card!!! BTW, it reminds me that my grandfather was an instructor in the Royal Canadian Air Force before the US entered WWII. After the US entered, he returned home and flew bombers and heavy cargo all through the war and then he got called back to fly in the Berlin Airlift. He always spoke fondly of his time in Canada! Now that's my idea of wings! Strangely, I don't have any plane stamps, so I'll have to stick with nature if I can find time to play along. OMG'osh! Love your card.... My DH is retired AF so we're all about fast jets! lol. So perfect for Heather's challenge. This is a fabulous masculine card. So much motion and energy, too. Great idea, perfectly executed. The sentiment is a great match.